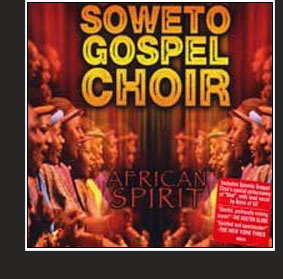 For their third album (the previous release, Blessed, won a 2007 Grammy for Best Traditional World Music Album), the now-world-famous ensemble of brave, passionate survivors, many of whom are living with HIV and AIDS, has crafted another heartbreakingly beautiful and inspiring program. They raise their voices in praise and hope, at peace with what cannot be changed but not remotely resigned about how to deal with it. The set list concentrates predominantly on South African spirituals but also includes pieces composed by Bono/U2 (“One”), Bob Dylan (“Forever Young”), and reggae icons Jimmy Cliff (“Sitting in Limbo”), and Bob Marley (“One Love”). There is even a rendition of “The World in Union”, official anthem of 1995 Rugby World Cup in South Africa, which is in turn based upon the “Jupiter” movement of Gustav Holst’s The Planets. Some listeners may cavil at the crossover tracks, and Bono, heard live with the choir, certainly isn’t shy about claiming his share of the spotlight. But building exclusionary fences around music has, thankfully, always been a colossal waste of time. Of whatever origin, each track is a miracle of fellowship, professed belief, and positive striving, interpreted by soloists and choristers of soul-deep, indestructible genius.